Breakfast is the most important meal of the day. That's why we serve it all day long! Enjoy a traditional breakfast items such as specialty omelets, breakfast sandwiches, eggs benedict, and pancakes, or try something exotic, like our stuffed French toast, Monterrey breakfast tacos or the Kitchen Sink Scrambler! We hope you'll join us for lunch if you're in the Lewisville area. With prompt service and a huge selection of lunch favorites, and great prices, Korner Café is a great spot for a casual meal. We're centrally located, directly across from Lewisville High School on Main Street. Take out and call-in orders are available. 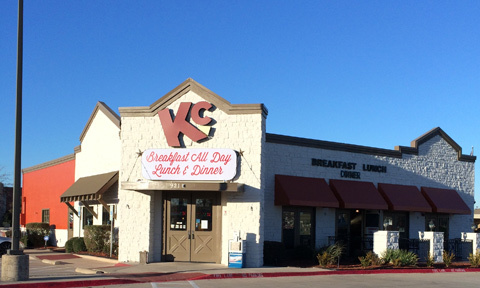 Welcome to the Korner Café, Lewisville, Texas' community restaurant. We are open seven days a week, serving a classic mix of sandwiches, burgers, steaks, seafood, salads and of course our extensive menu of breakfast items which are available all day long. We also offer a menu just for kids. If you're a Lewisville local, or just passing though, we invite you to dine with anytime.